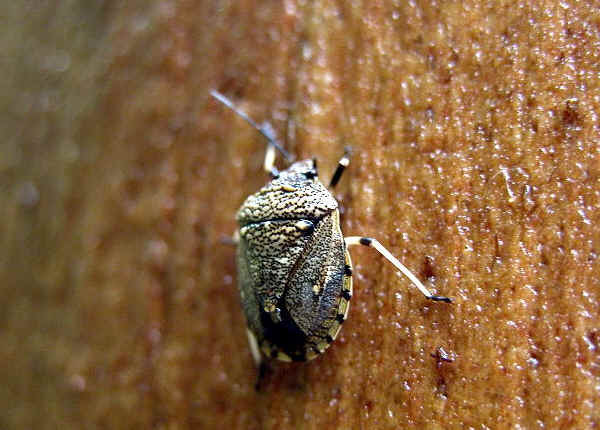 This page contains pictures and information about Toad Stink Bug in genera Platycoris that we found in the Brisbane area, Queensland, Australia. 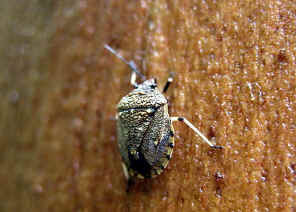 There is eight Australian species in Genera Platycoris. We found one species in Brisbane. 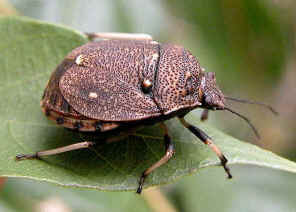 We found this bug in rainforest near Mt Nebo during late summer Apr 2005. There were quite a number of them on large gum tree trunks during the day. Some found resting on leaf. We call them Toad Stink Bug because we found on the internet, Murray Fletcher called a Hypogomphus sp., as "Toad Stink Bug". We agreed that this common name is also suitable for the stink bug that we just found. The stink bug has a round and thick body, brown in colour with typical stick bug colour pattern. Its antennae are five-segmented. Its thorax surface is rough, resembles the toad skin. The membrane part of the wings reduced to very narrow, hardly covered the abdomen. Legs are black on the femur and creamy-white on tibia. Gordon F. Gross's book (1976) put this species in Caspocris group but suggested that this species should be in another group. We followed Australian Biological Resources Study and put this in Tribe Halyini. 1. Insects of Australia, CSIRO, Division of Entomology, Melbourne University Press, 2nd Edition 1991, pp 509 (Hypogomphus bipunctatus). 2. 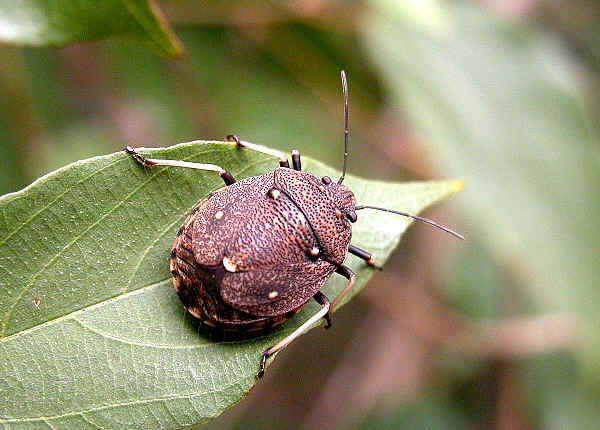 FaunaKeys - Stink Bugs of Australia, Australian Museum online 2003. 3. Platycoris bipunctatus - Australian Biological Resources Study, Department of the Environment and Heritage, Commonwealth of Australia 2005. 4. 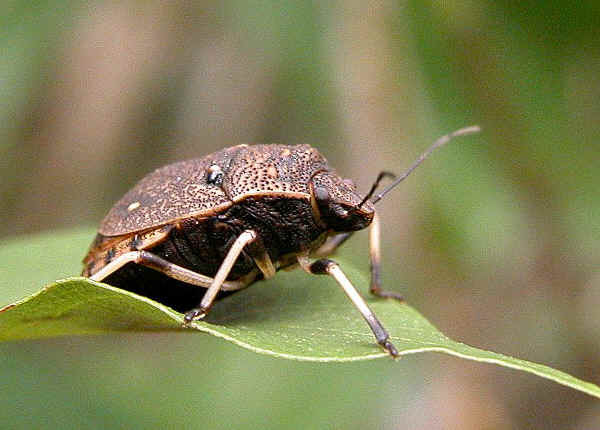 Platycoris Guérin, 1831 - by Gerry Cassis, Emma Betts and Michael Elliott, Stink Bugs, Fauna Net, Australian Museum 2002. 5. Plant-feeding and Other Bugs (Hemiptera) of South Australia. Heteroptera – Part II - by Gordon F. Gross, South Australian Government Printer, Adelaide, 1976, p341. Last updated: August 11, 2010.